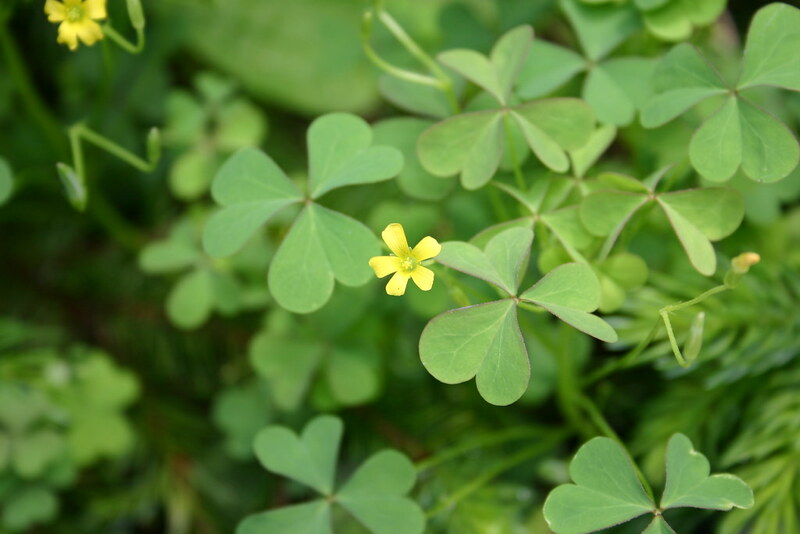 As small children, my siblings and I considered yellow wood-sorrel (Oxalis stricta) to be a tart treat worth searching for on hands and knees through the lush, trackless lawn of our backyard. When one of us discovered the rangy green plant, which we called sourgrass, we’d gather like lambs to nibble the shamrock-shaped leaves and tiny yellow, five-petaled flowers. When I was older and got drafted to weed the vegetable patch, I still pinched off the occasional leaf to chew as I filled my basket with clump after clump of wood-sorrel. No rarity in the garden’s tilled soil, it flourished amid the bean rows and tomato plants. Nowadays, I still find yellow wood-sorrel just about everywhere I garden—from the semishade under the deck to sunny areas the mower doesn’t regularly reach. It even pops up in my three-foot-high raised beds, attesting to the shooting range of the seeds, which are violently ejected from the plant’s dry seed capsules (a type of seed dispersal called explosive dehiscence). Several other, less prolific, species of native Oxalis also grow in the Northeast, including the delicate-looking O. montana, which has light pink flowers with darker pink stripes and reddish leaves. 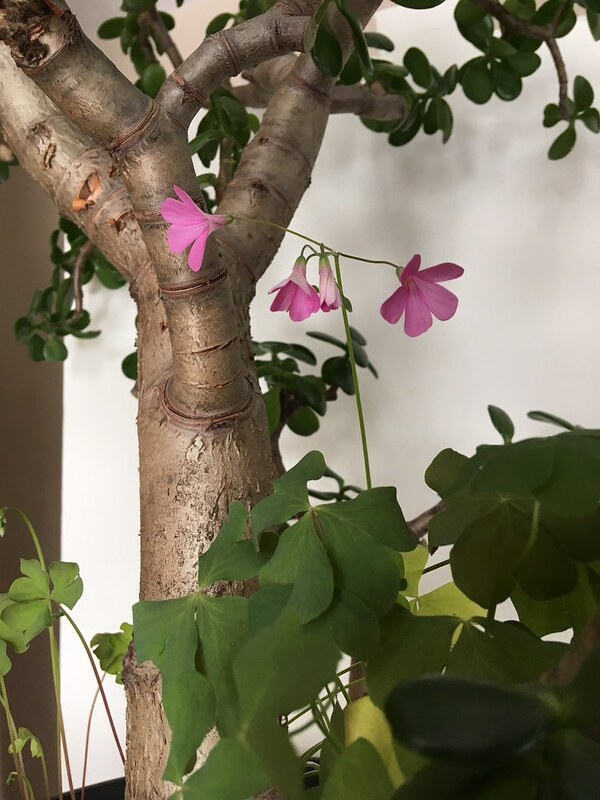 I have even discovered what I believe is violet wood-sorrel (O. violacea) growing in a pot in my living room with one of my jade plants, evergreen and blooming year-round in the human-controlled climate. Since O. violacea is considered a threatened species in New York State, I am watering my jade more than it probably likes to keep my “weed” happy. Able to examine it up close, I daily witness an interesting plant behavior, nyctinasty: At night and on cloudy days, the leaves and flowers fold up, reopening when the sun returns. Yellow wood-sorrel also exhibits nyctinasty, and although the benefit of this behavior is not entirely understood, it likely helps the plant conserve energy. And energetic this species certainly is. In addition to producing copious numbers of ballistic seeds, this annual (and often perennial) plant can also reproduce vegetatively. It forms a taproot and is upright when young, but as it grows, its long, multibranched stems eventually flop over and trail out along the ground for as much as two feet, extending rootlets from nodes along the stem. The good news from a gardener’s standpoint is that even with its taproot and secondary roots, yellow wood-sorrel is easy to pull, and the mass of a single mature plant leaves a very satisfying clearing when it’s removed. Hand weeding is the most effective method for wood-sorrel, and its three-part, heart-shaped leaves and yellow flowers make it an easy plant for the youngest gardeners to identify—and sample—as they help you pull! Oxalis stricta (yellow wood-sorrel). Photo by SB Johnny. The author has found what she believes to be Oxalis violacea in her potted jade. Photo by Joni Blackburn.